The clean up and finishing of the record room took a bit longer than I hoped but I should have known better since I do procrastinate a bit. There was a lot to do, and I documented each step so check it out! Mr. Richard painted all the new crates we picked up. This meant all of the albums needed to be taken down and stored until the paint dried. Daria helped us out which is unusual, seeing as she normally avoids the camera like it’s going to attack her. Unless she’s eating cheese or trying for the bacon, then she’s so distracted she doesn’t care. While everything was being put away again, it was the opportunity I needed to make sure everything was alphabetized. I had never organized the various artist albums so those all needed to be done and sometimes, albums get moved a little to the left, a little to the right so it was good to double check everything again. There were also stacks upon stacks in the living room that needed to be put away! Did you check out the videos on Instagram and Facebook that I posted while organizing? If not, hop on over to my social media pages. The videos are time lapsed so they’re really quite interesting. 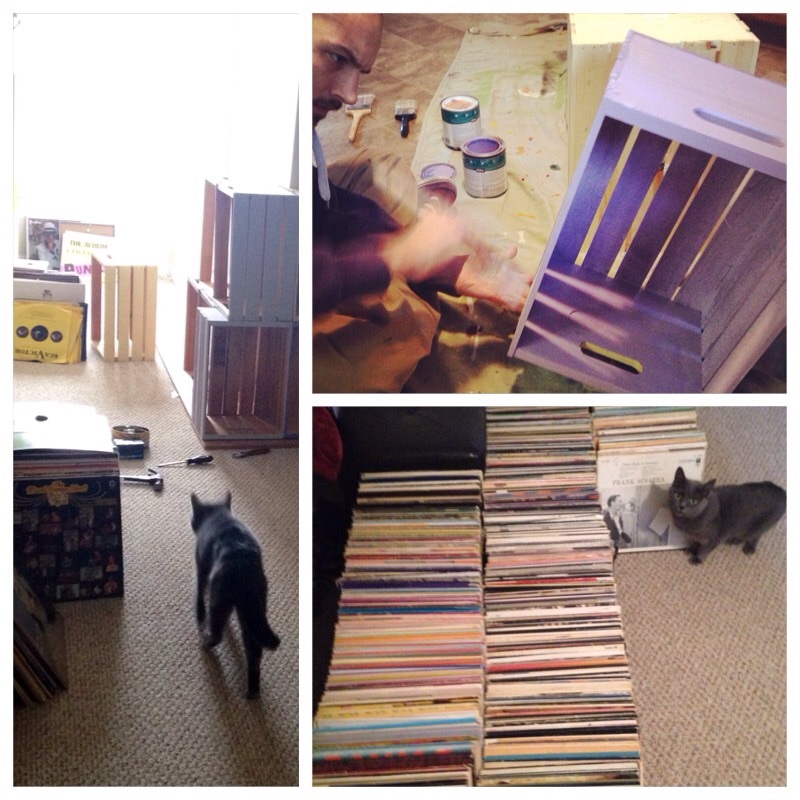 Below is a collage of the room right before we started putting in the finishing touches. We had to run out and get a few more crates so everything would fit so it seemed like the right time to snap a few pictures to show how far I had come. 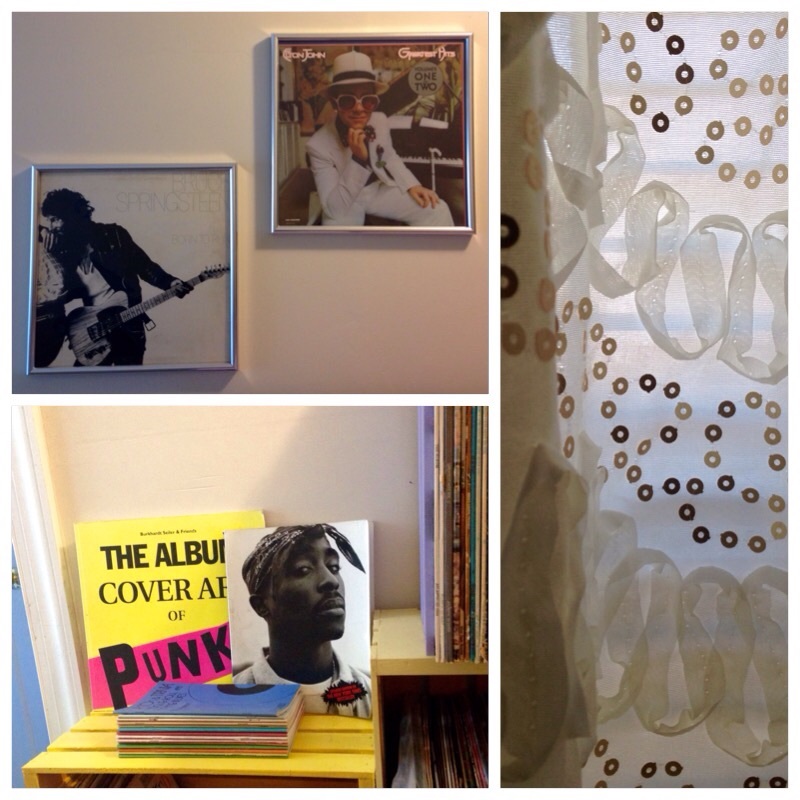 Just about every 12″ was put away and our new curtains were also on the way. Of course they came on a day when Mr. Richard and I were both out. That almost never happens! 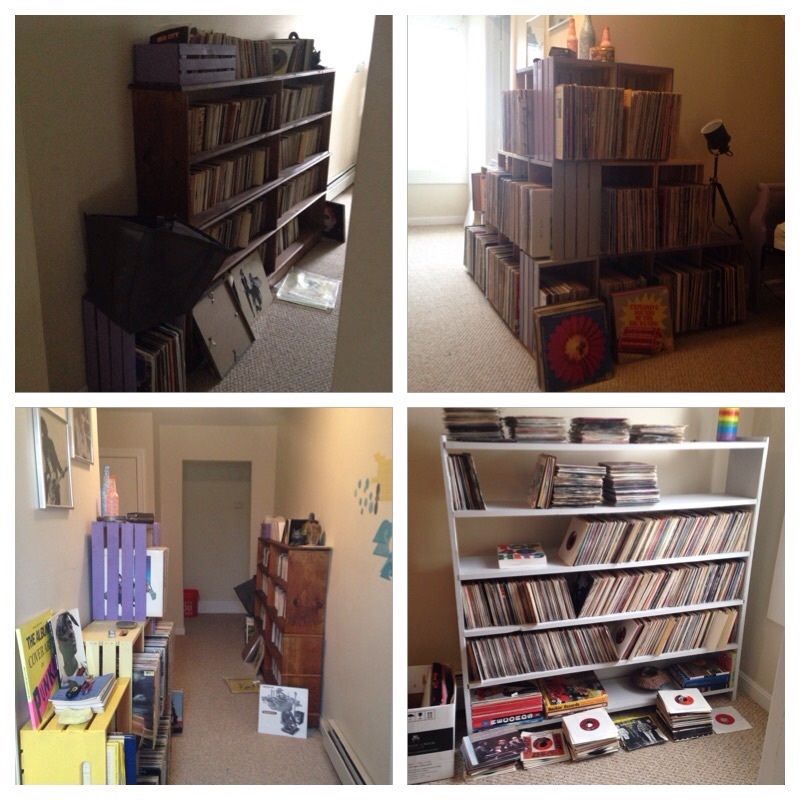 After the new crates were in place, the 12″ disc section was done (aside from stuff that’s in the living room in the to-be-catalogued pile) but there was still some work to do. 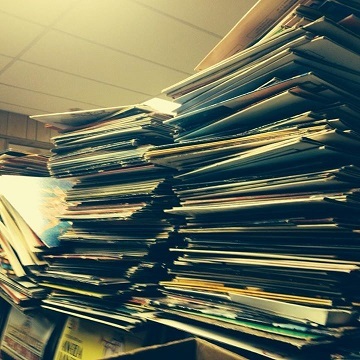 The 7″ discs are still being cataloged so there’s some piles that didn’t fit where they should have. I tried to shelf as many of these piles but it’s hard to do since I can only catalog about 50 every two weeks. Anybody want to help me out? I have such a specific process, the roomie can’t even really figure it out! As the weeks went on, I did get more put away and finalized some of the décor choices. The top right is a collage down the left wall of the room, the top pictures being the first shelving unit you see when you walk in. As you walk down that side of the room, you reach the second shelf for singles. As you can see, a ton of the piles are put away on the shelves and the curtains made it up! Across from that wall is our daybed. 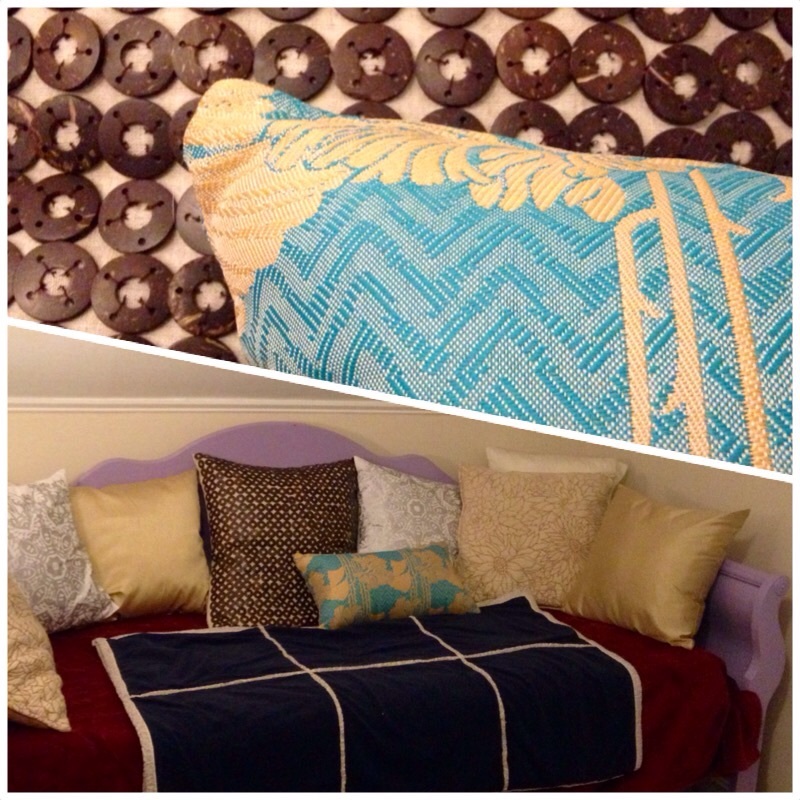 Without my day job and the employee discount, I wouldn’t have been able to outfit the bed with all the pillows. It makes it super cozy and the large one is great for pulling onto the floor to sit on while you thumb through the crates. As much as I have a distain for having to help customers, the employee discount makes it worth it! With all the different pillows, texture on the curtains and records themselves, the room has turned into this really comfortable, homey slightly bohemian place. You’ve see the yellow submarine decal before, but I managed to set out some books and hang the record frames too. Obviously, there’s still some work to do and I’m excited to set out some of our art on the shelves, but I’m really happy with the progress. 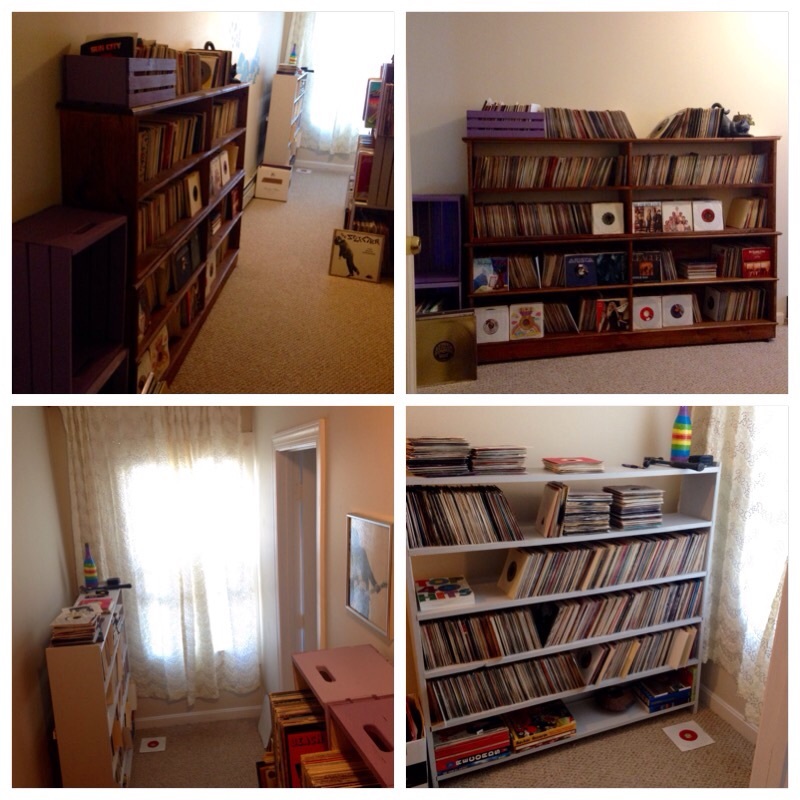 Did you know it’s been over two years since I’ve discussed vinyl storage? It’s unbelievable how far my own care of the collection has grown in addition to finally having the full collection in my possession now. Don’t believe me? Check out that original post HERE. Since so much has changed, I want to revisit some of the same storage tips and provide images of what you should and shouldn’t be doing to keep your collection in excellent condition. 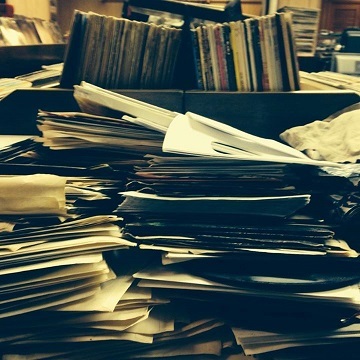 I’ll be providing a digital tour of the actual record room next week so be sure to check back. 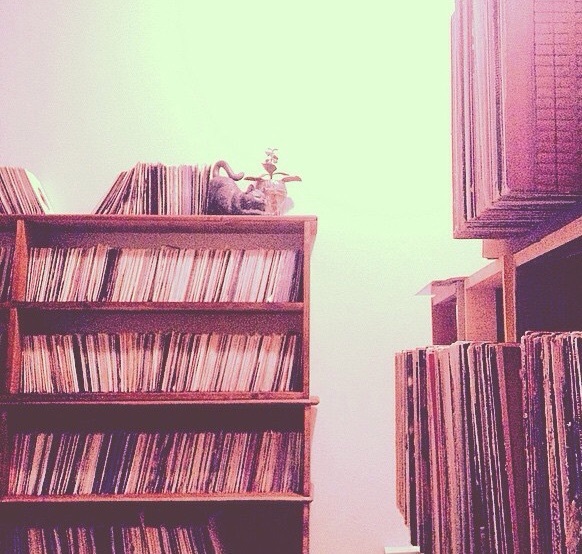 As you can tell from these first two photos, the vinyl is stacked all on top of each other. Not only are you unorganized and it’s harder to find what you want when you go to listen to it, it can warp the vinyl. You don’t want your favorite jam skipping or worse, becoming completely unplayable. Which leads me to jamming your vinyl into one crate. I like to leave room to not only finger through the stack and easily pull something out, but also enough room that I could add one more album without needing to arrange the shelves again. You should have sturdy dividers, because if you’re storing on an angle, even a slight one, the first album is going to bear all the weight of the other albums. You also shouldn’t expose your albums to the elements; extremely cold and damp areas or hot and sunny spots. Damp areas mean mold and ugh, it’s just the worst. With heat, you get warping and the sun fades the covers. 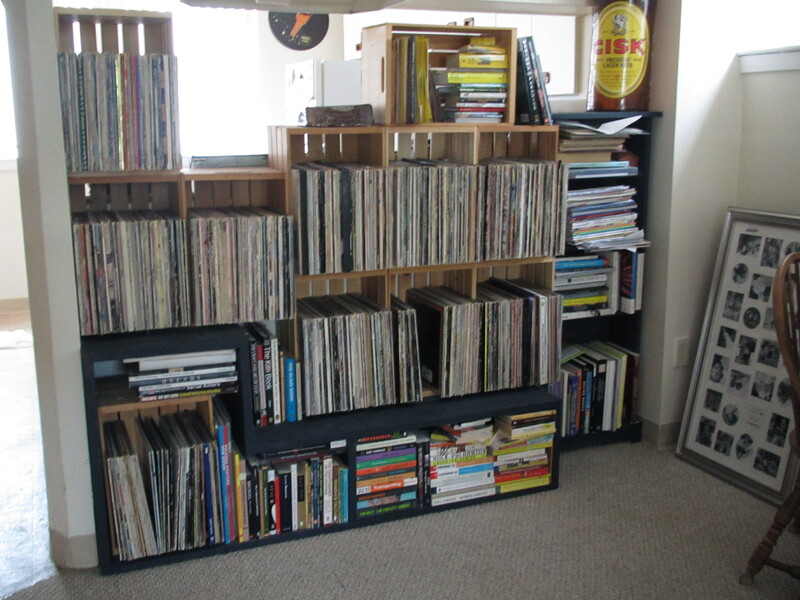 Owning records to make them last can be tricky, but just find a spot in your home (not the basement), out of direct sun and use shelving to keep them away from direct heat sources. You’ll see we have a baseboard heater in the record room so I just avoid using the bottom shelf of the open unit and keep the shades drawn most days unless taking pictures or looking for something during the day. Now, let’s get a little more positive and talk about some dos for your collection. The below picture is also a better way to keep your storage, as it’s upright and shows the different sizes stored separate from each other. I’ll be honest, some of sleeves have been victims to the cats. It disappoints me but it’s a lesson learned. We’ve trained the cats now to use actual scratching posts and I’m comfortable having the full collection here with me. I sometimes break my own “rules”, like not having dividers on long shelves but I know I won’t ever be selling the collection as it’s such a part of me that I’m okay with being a little bit naughty here and there. That’s life I suppose! Hope you all found this useful and look forward to the tour of the music room next week. I’m really excited to put the finishing touches in this next week and show it off! Have a great rest of your week and be sure to check out the social media pages for more pictures and updates!!! 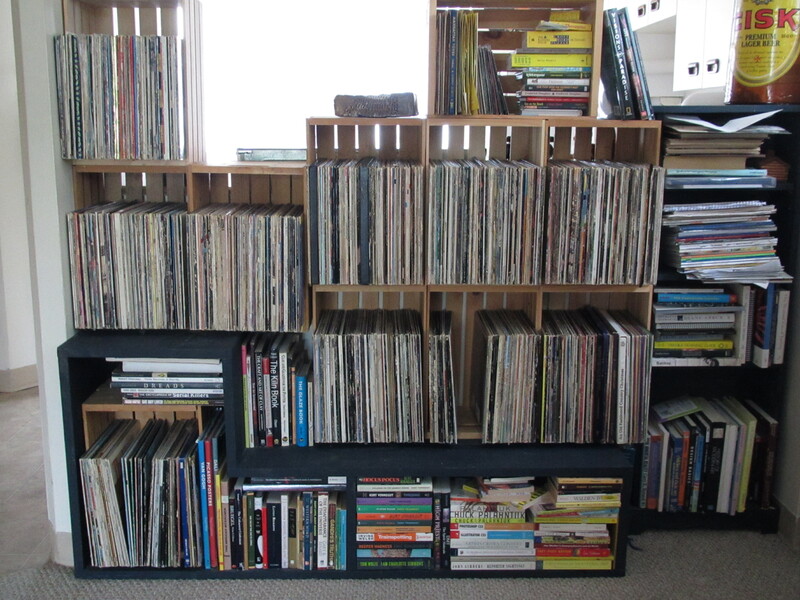 Storing albums is key to keeping the collection alive: no sunlight, upright, not cramped, no dust, etc, etc. I have started making a custom shelving system of sorts from wooden crates (larger than your typical milk crate) and stacking them. It’s become a combination book and album shelf and needs a paint job again but it does the trick. This way, I can keep everything vertical and take advantage of being able to stack as I go. I didn’t have enough crates, so any album with multiple artists is kept in my entertainment center on a few shelves (again: vertical and slight loose). They key is keeping them out of direct sunlight (which is easy in our basement level apartment) and making sure they’re in the crates loosely, but not leaning. I always want to be able to slide the albums out of their place easily especially since I do try to keep everything in ABC order. When I take a stack out to enter into Excel, it’s for an hour or two and then everything is put back. Unfortunately there are some albums without covers so I need to check those out and get proper covers. Everything else is kept vertical in large plastic tupperware in a temperature controled basement/garage at my mom’s until I have the space for everything. She won’t part with them case by case so it’s all or nothing. I’m not sure if it’s in the cards until I move next year unfortunately. Someday though! It’s not always ideal, but I do what I can! How do you keep your albums? Oh and be sure to check out this much better article on storing albums here!